The Composers of DOCTOR WHO - Dudley Simpson | Warped Factor - Words in the Key of Geek. Christopher Morley continues his look at the many musical maestros who have worked on Doctor Who. 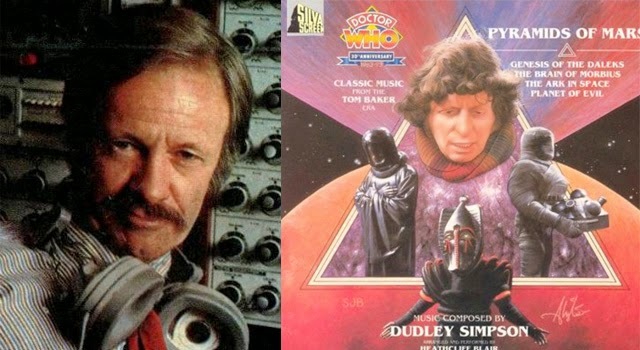 This week it's the man who made more music for Doctor Who than any other of his fellow composers - Dudley Simpson. Dudley Simpson scored 62 episodes of Doctor Who, from Planet Of Giants ( 1964) to The Horns Of Nimon (1980). Born in Melbourne in October 4, 1922 ( which means he's recently celebrated his 92nd birthday!) he began his musical career by composing for what was then known as the Borovansky Ballet Company, first as a pianist then rising to conductor-named after its founder, Czech ballet dancer, choreographer & director Edouard Borovansky. We have the late legendary ballerina Dame Margot Fonteyn for persuading Dudders to come to England in the first place! She'd met him while touring Australia, & he would go on to take up a role as conductor/musical director at the Royal Opera House. In this role he'd once more work with Margot, as well as another giant of ballet- Rudolf Nureyev. A chance meeting with a BBC producer led to him leaving the world of ballet behind- his work rate enabling him to in effect become composer in residence on Doctor Who for a ten-year stretch from 1970-80, spanning the Third & Fourth Doctors. In episode terms that's Spearhead From Space-The Horns Of Nimon, exactly. Perhaps in recognition of his great service/music, he even has a cameo as the conductor of the Palace Theatre orchestra in The Talons Of Weng-Chiang ( which you can learn more about by watching the The Last Hurrah documentary in the extras on the DVD release of the story), for which he was paid as a Musicians Union member! Typically, he would arrange his scores for small groups of musicians ( roughly horns, clarinet, doubling saxophone, bass or contrabass clarinet, piano, doubling electric organ, and timpani/percussion) & then work alongside the Radiophonic Workshop to augment his acoustic music with electronics. He'd also find time to work along similar lines for former Who writer Terry Nation's subsequent series Blake's 7. First airing in 1978, it would run until 1981 with Simpson behind the music for 50 of the 52 episodes of its run ( the other two, Duel & Gambit, handled by Elizabeth Parker). He would soon no longer be required on Doctor Who either! Upon John Nathan-Turner's appointment as producer in 1980, he was informed that the music/sound design for the series was to be updated & handled in-house by the Radiophonic Workshop. And so he signed off with The Horns Of Nimon. 'Hang on a minute', you're probably thinking. 'Didn't you say he started in 1964? What about the early stuff then?'. Good questions, both of them! After his maiden score for Planet Of Giants he would handle The Crusade, The Chase & The Celestial Toymaker from the First Doctor's run. Following a first regeneration, Dudley would provide music for The Underwater Menace, The Macra Terror, The Evil Of The Daleks, The Ice Warriors, Fury From The Deep, The Seeds Of Death, The Space Pirates & The War Games. ...though a novelisation by Gareth Roberts hit the shelves in 2012, & he'll be doing the same for City Of Death early next year as part of a deal with the estate of Douglas Adams! In truth given his 62 episodes there's probably more than enough music from him to compile a similar tribute to his work alone. Surely there could be no greater tribute- & if anyone from BBC Four is reading this, why not commission a nice documentary on the man & his music, too? Surely its long overdue, & he is in his nineties- so can't afford to hang around! As you'll see ' Gwylock1' needs help locating sheet music for Dudders's Who scores in order to faithfully recreate them himself, having been engaged in the noble quest for around a year. If you can help or indeed are him, feel free to get in touch! Quite a legacy right there, we're sure you'll agree! This article was originally published October 24th 2014.